FIA president Jean Todt says Formula 1 will improve the sound of its new engines, but dismissed demands from Ferrari and Red Bull for rule changes. 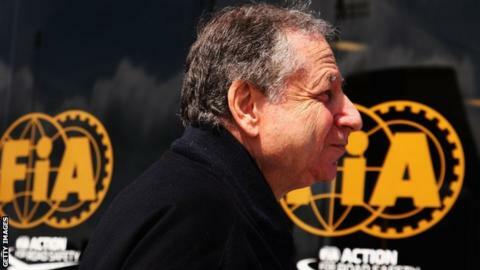 Todt, the head of motor sport's world governing body, said he could "not just listen to all the influential people". He added: "Do you hear [championship leader] Nico Rosberg complaining? Did you hear [world champion] Sebastian Vettel complaining last year? "Those doing well aren't complaining, those that aren't, are." For the rules to be changed mid-season, unanimous approval of all teams is required. Red Bull want the sport to abandon the fuel-flow restriction that is at the heart of the new efficiency-based formula, while Ferrari president Luca Di Montezemolo is worried F1 is losing its appeal to the audience. Speaking before Sunday's Bahrain Grand Prix, he said: "The driver has to save tyres, save fuel, this is not F1. F1 is extreme from first to last. It is the engine music and not too complicated rules. "We cannot have an F1 that is an energy/fuel economy formula. The public doesn't like a taxi driver that has to respect the fuel; this is not F1. "The second problem is the music of the engine, not the noise, the music. And the third is that the rules are too complicated, particularly for the people on the track. How can they understand the fuel meters? It's really complicated." Ferrari have been pushing for the 100kg maximum allowance of fuel for the races - the second part of the engine restrictions - to be increased by 10kg. But McLaren Group chairman Ron Dennis said F1 had to take a "more social responsibility-driven position". He said: "The simple fact is we live in a world where hydrocarbons are depleting, the environment is being threatened. Yes, we have to be the pinnacle of motorsport, but that means we have to the absolute latest technology. "There is some very obvious short-termism, driven often by a lack of competitiveness certain teams have, and they use everything to try to address their shortcomings." Di Montezemolo accepts nothing can be changed this season, which has so far been dominated by Rosberg and his Mercedes team-mate Lewis Hamilton. "It doesn't mean we have to change now but we have look ahead together," he said. "F1 is more important than the rules; we have to think about the future together." F1 commercial boss Bernie Ecclestone added: "I don't think the way things are at the moment are acceptable to the public." Todt said F1 had made a major technological step forward this season, saying Rosberg's pole position time in Bahrain was only 0.8secs slower than last year, despite heavier cars, reduced aerodynamic downforce and a fuel restriction. But Ecclestone implied he would like to make changes this season, saying: "Everyone is complaining, even Mercedes. They don't like people being unhappy, so they're going to be behind it. "We can do things without them particularly losing their advantage. Without any doubt they have done a better job and they shouldn't be punished for that. But let's see what happens when they all really start racing." Ecclestone said the Formula 1 engines were "incredible" because of the power they produce from "such a small amount of fuel". But he added: "I don't think that's Formula 1 business. They should do it in touring cars or something, but not in Formula 1." Mercedes non-executive chairman Niki Lauda told BBC Sport he accepted something needed to be done about the sound of the engines, having heard they were quieter and less dramatic than those of the cars in the GP2 feeder formula race. However, he insisted the fuel-restriction formula was "absolutely right" for F1 because it corresponded with the direction road-car manufacturers were following with their new engines. Mercedes non-executive chairman Toto Wolff said talk of changing the rules mid-season was "absurd".